Provided below are select resources and reports from NCBPA and industry organizations containing market research and trends on the benefits of home and building performance, the importance of key policies and more. Our Summit event held on September 20th in Raleigh was a tremendous success thanks to the more than 60 industry professionals that attended and our excellent Sponsors and Facilitators. Since the event ended, the NCBPA Team has been processing and compiling the results, recommendations and best practices provided by attendees and speakers. Today, we’re pleased to release the second part of our final report. Be on the lookout for part three in the coming weeks. Members and survey participants – click here to download the report (password protected). Need the password? Email us at Info@BuildingNC.org. What do commercial architects, builders, contractors and others need to be successful in our market? What are their greatest challenges and where do they find the most success? These questions and many more (51 in total!) are answered in NCBPA’s 2018 Commercial Industry Survey. 42 individual respondents took the time to answer a wealth of questions from NCBPA regarding where the industry is now and what they need to be more successful. Categories include architecture, building commissioning, automation and controls, workforce development and more! The results of this survey are available to NCBPA members and survey participants only. Not a member? Join NCBPA today to gain access to this important industry insight! 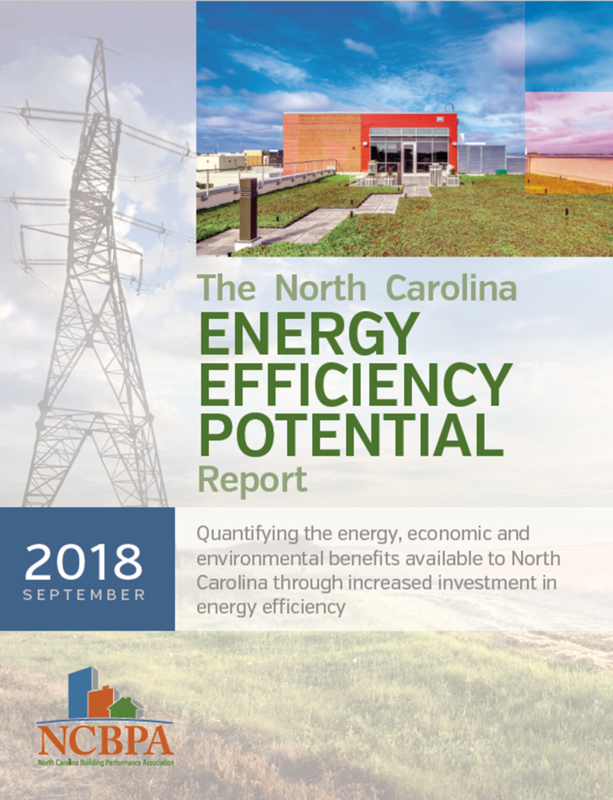 The North Carolina Energy Efficiency Potential Report provides comprehensive quantitative data to inform policymakers, utilities, industry professionals, consumers and others of the widespread benefits available through an underutilized energy efficiency market in the state. 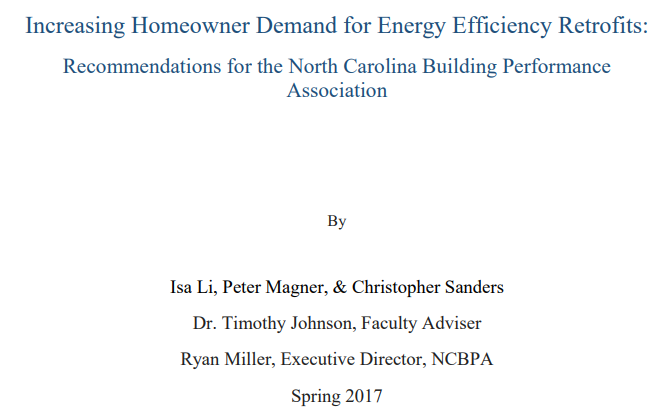 Written by NCBPA, the report is a compilation of research reports, case studies and new analysis detailing how North Carolina’s energy sector, environment, economy, workforce and consumers would benefit from increased utilization of the state’s already strong, but vastly underutilized, energy efficiency market. The report recommends state and local policy development and related initiatives that collect utility and market data needed to prioritize the policy recommendations. Economic impact estimates resulting from these policy actions follow, focusing on job creation, local economic development and environmental benefits. 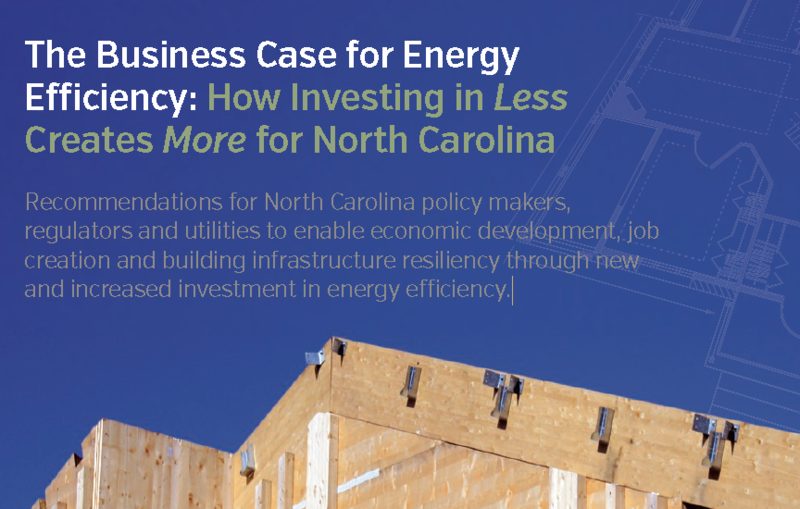 To conclude, the report recommends new legislation that sets in motion the studies, initiatives and strategies needed to advance the use of energy efficiency in North Carolina. Click here to download a print version of the report (single pages). Click here to download a web version of the report (side-by-side pages). Click here to read our press release announcing the report. Search Twitter for hashtag #ThatsBuildingPerformance to view social media posts about the report. What do residential architects, builders, contractors and others need to be successful in our market? What are their greatest challenges and where do they find the most success? These questions and many more (73 in total!) are answered in NCBPA’s 2018 Residential Industry Survey. 91 individual respondents took the time to answer a wealth of questions from NCBPA regarding where the industry is now and what they need to be more successful. Categories include architecture, new construction, crawlspaces, HVAC, workforce development and more! The results of this survey are available to NCBPA members and survey participants only. Not a member? Join NCBPA today to gain access to this important industry insight! 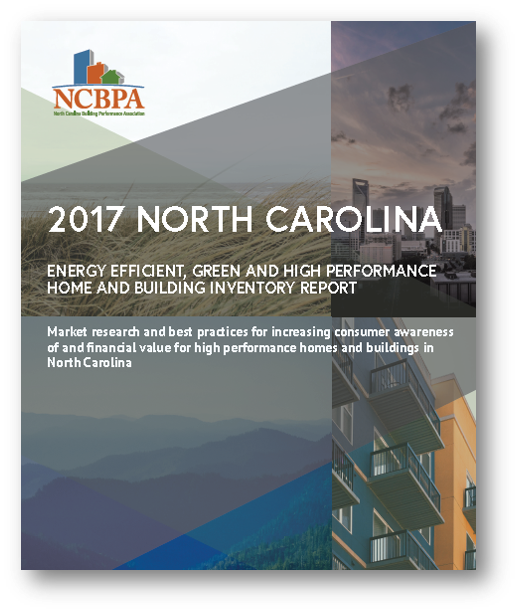 NCBPA’s 2017 Inventory Report identifies 34,152 high performance homes and buildings being built or retrofitted in the state in 2016 and finds a 9.5% price premium for high performance homes sold in three of North Carolina’s metro markets between 2015 and 2016. Since 2007, the report identifies 198,525 high performance homes and buildings in the state. Each year, the report analyzes data from certification and rating programs used to measure homes and buildings for energy efficient, green and high performance features. The 2017 report includes what is believed to be the most comprehensive high performance home sale price analysis performed to date in the country, which compares the prices of 3,908 high performance homes sold in the Charlotte, Triad and Triangle markets between 2015 and 2016 to all other home sales. Where are North Carolina’s minimum code standards and high performance building options headed? NCBPA’s spring 2018 Architectural Intern Henderson Beck performed in-depth research to find out! This research culminated in a 1-hour webinar presenting key changes to NC’s upcoming 2018 residential and commercial energy code as well as forecasts of high performance design, construction and product features that may be included in the 2024 and 2030 codes. Utility and Regulatory Environment: Expand and modernize utility energy efficiency programs and the regulatory environment that regulates them to achieve at least 1% net utility energy efficiency savings by 2023. Building and Energy Codes: Adopt and provide education on improved building and energy codes, add an energy seat to the NC Building Code Council and promote above-code utility energy efficiency incentive programs. Reduce Market and Regulatory Barriers to Entry: Support increased consumer education, decreased regulatory hurdles and offer public/private consumer financing programs to enable increased participation in energy efficient construction. Energy, Water and Performance Benchmarking: Create and implement a statewide plan that establishes voluntary and mandatory energy, water and performance benchmarking in homes and buildings. Multifamily and Low-Income Financial Barriers: Reduce the financial barriers that prevent builders, owners, occupants and federally-funded programs from participating in energy efficient construction in multifamily and low-income homes and buildings. Click here to download a copy of the full report. Click here to download a checklist of the recommendations only. NCBPA worked with students from Duke University’s Nicholas School of the Environment on this valuable report completed on April 26, 2017. Click here to access the report. Abstract: With rising concern aimed at energy consumption and its environmental impacts, efforts are being made to conserve energy across the United States. Nearly half of all domestic energy use is dedicated to homes and buildings. Despite significant strides by the homebuilding industry to design new energy efficient structures, a significant portion of the current housing stock includes inefficient, poor-performing homes. The North Carolina Building Performance Association (NCBPA) tasked us with identifying the barriers preventing homeowners from investing in home energy retrofits and offering pertinent recommendations to address these roadblocks. Through an exhaustive review of current literature and key insight from industry leaders, we distilled the many barriers into four areas: consumer education, home valuation, financing, and marketing. Our recommendations include building-out NCBPA consumer education website, hiring of a full-time data manager to create an inventory focused on capturing metrics surrounding home valuation, developing a conjoint marketing plan to target specific audiences, and continuing to push for commercial PACE and on-bill financing in North Carolina. The study identified 39,110 units as being built or retrofitted in 2015, which equates to nearly 63% of the roughly 62,000 new and existing units built or retrofitted in the state during the year. Beginning in 2007, North Carolina has experienced an annual increase in the number of units reported. However, 2015 was the first year of lower total units reported, down 1,354 (~3%) from the 2014 peak of 40,464 units. Click here to download a copy of the full report. Click here to download the press release. 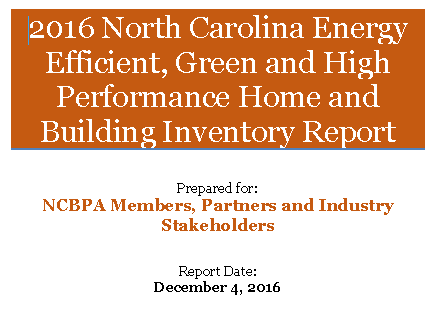 In 2015, NCBPA completed a first-of-its-kind market study to inventory as many of a state’s energy efficient, green and high performance homes and buildings as possible for the purposes of better understanding the quantity of units in North Carolina, defining areas of strong and weak saturation, and increasing engagement from industry stakeholders seeking to increase the number of units being built and retrofitted in the state. Results from the 2015 study, performed with UNC Charlotte’s Energy Production and Infrastructure Center (EPIC) resulted in the identification of more than 122,000 North Carolina homes and buildings built or retrofitted since 2007 as being energy efficient, green or high performance through primarily third party energy efficiency and green building certification programs and rating systems. Click here to download a copy of the report. Click here for a PDF presentation. Click here for the press release. Guide for Benchmarking Residential Energy Efficiency Program Progress with Examples (Better Buildings, 2015). Green and Healthier Homes: Engaging Consumers of all Ages in Sustainable Living (Dodge Data & Analytics, 2015). EE design helps school in Hoke County NC save $35M over 40 years (USGBC). 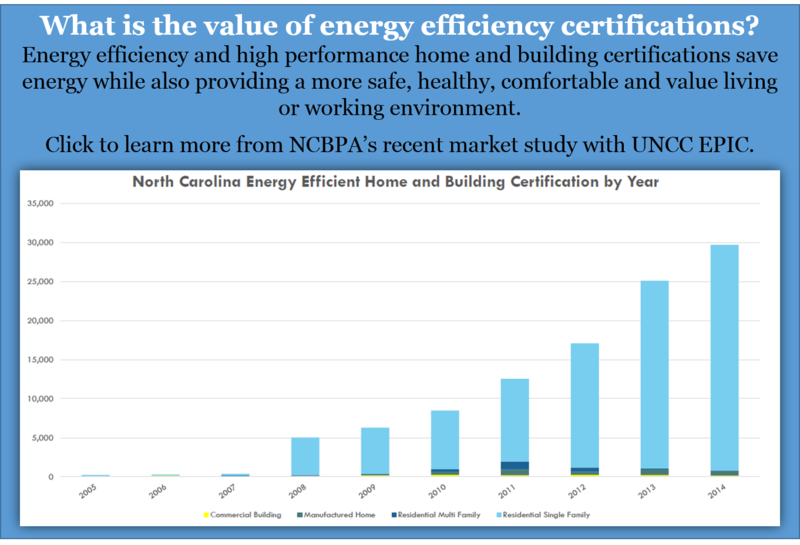 2013 study on the impact of EE certified homes in NC (NCEEA). Energy efficiency trends in residential and commercial buildings (DOE). 121,000+ energy efficient homes and buildings built in NC since ‘07 (NCBPA). Report outlines why your NC electric bill is increasing (NCSEA). EE as a low-cost resource for achieving carbon emissions reductions (EPA). A Policymaker’s Guide to Scaling Home Energy Upgrades (SEE Action, 2015). Lessons from the History of Efforts to Value Green and High-Performance Home Attributes in the United States(Lawrence Berkley National Laboratory, 2015). How Energy Efficiency Progams Can Help Capture Efficiency in Real Estate Transactions (Better Buildings, 2015). 2011 study on the increased value of EE homes in NC and US (NCEEA). Enhancing Community Resilience through Energy Efficiency (ACEEE, 2015). Report: Energy Efficiency Program Provides Big Boost to Minnesota’s Economy (Electric Energy Online, 2015). Economics, employees and environment keys to EE buildings in NC (USGBC).